Notes: 1. 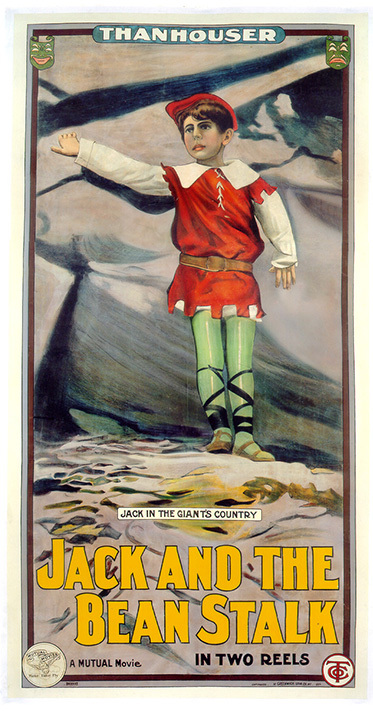 Leland Benham was identified as Jack in a Thanhouser advertisement for the film, which appeared in The Moving Picture World, December 20, 1913, as well as in an advertisement and synopsis which appeared in Reel Life, December 13, 1913 and in a cast listing in The Photoplay Magazine, February 1914. In the December 13, 1913 issue of Reel Life, on page 36, appears a photograph of Leland Benham in the role of Jack, which confirms the attribution. However, a review of the film in The Moving Picture World, issue of December 27, 1913, stated that Jack was played by the Thanhouser Kid (Marie Eline), as did a review in The New York Dramatic Mirror, December 31, 1913, which stated: "The acting of the Thanhouser Kid, who takes the lead, is some of the best work that he [sic] has done." 2. An article in Reel Life, April 25, 1914, quoted Arthur B. Lent, who supervised the technical and mechanical effects used in the film: "In Jack and the Beanstalk we buried an artificial beanstalk about thirty feet long in a hole in the ground and gradually raised it on invisible wires until it reached its full height. Then for the beanstalk we substituted the trunk of a tree of the same diameter as the flimsy beanstalk and 'planted' it solidly into a cement-filled hole. The camera, of course, had been stopped meanwhile, but when Jack commenced his climb into the giant's kingdom in the air no one but those utterly devoid of imagination could have doubted for a moment that it was the identical sprout which Jack used some six hundred years ago when the young man's exploit was first recorded by that faithful chronicler, Mother Goose." BACKGROUND OF THE SCENARIO: The origin of this tale is obscured in time, but it was known at least as early as 1734 in England, when it was included in Round About Our Coal Fire, or Christmas Entertainments, an anonymously written book pointing out the lack of value of folk stories. One chapter was titled "Enchantment Demonstrated in the Story of Jack Spriggins and the Enchanted Bean," which told of a lazy boy raised by his witch-grandmother. She loses a magic bean, which is retrieved by a cat from the fireplace. Jack plants it, and the stalk grows at a rate of more than a mile in height each hour, and in the process "some little towns were built upon the leaves." Jack visits one of these towns, is offered ale at an inn, and sees the innkeeper transformed into a winsome lass, because the witch (his grandmother) had lost her powers. It develops that the cat who retrieved the bean from the fireplace was the lass transformed. Jack, now known as Prince John, and his bride rule a kingdom, and he becomes known as "Monarch of the Universe." By 1807 The History of Jack and the Bean-Stalk, Printed From the Original Manuscript Never Before Published, appeared in England under the imprint of Tabart and delineated a version of Jack in the days of King Alfred, the only child of a an impecunious widow who sends him to sell her cow. Jack trades it for beans instead, and his mother, disgusted, throws the beans away - only to find that several quickly sprouted, twined together, and created a stalk of immense proportions. This set the theme for most subsequent versions of the tale. "There is scarcely any kind of production so delightfully effective in motion pictures as dramatizations of the old fairy tales. On the screen, moving with magic fleetness, the most improbable incidents seem true - fairy changes take place before our eyes - and the beauty and grace and singularly bewitching quality of Hans Andersen or Grimm or Andrew Lang are far more realistically reproduced on the screen than they ever have been on the stage. Also, more and more, the demand is growing for motion picture plays, especially adapted to children. The best theatres are introducing juvenile programs - a 'Children's Hour' - and the public is enthusiastically backing this movement, which will make it possible to diminish the number of children crowding in to see films depicting criminals, or society scandals, roughhouse comedies, or fighting and killing - simply because they can't get anything else. Mr. Lonergan's dainty version of Jack and the Beanstalk is a promising forerunner of the new children's repertoire." "A famous old story treated (almost for the first time in its life, one fancies) as a serious and respectable, romantic drama. After the many flimsy pantomime absurdities of which it has been made the basis, it is pleasant to find the legend handled for once with the regard for its better qualities which its merit in these respects deserves. The Thanhouser Company gives us an orderly, straightforward and realistic presentation of the fine old tale, and it is as refreshingly novel as it is interesting, although not ambitious from a spectacular point of view, it is prettily and effectively staged, and makes altogether a very good entertainment, which will be especially popular with children, and which is, obviously, thoroughly suitable for the Christmas season. 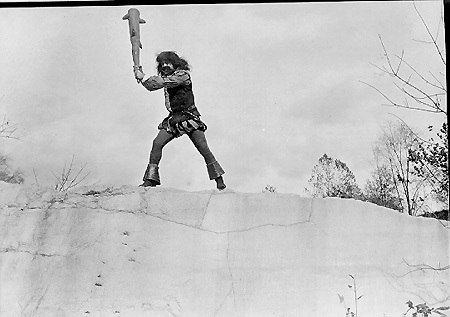 The short bit of low-comedy business contributed by the giant's wife in one place might be dispensed with advantageously, as the banalities of ordinary pantomime are rigorously avoided throughout the rest of the film." "The nursery tale has been prettily dramatized by Lloyd Lonergan for the special benefit of children. Leland Benham is Jack, while the Thanhouser Kidlet appears as Golightly, a Fairy." "A reel and a half number depicting the good old tale of the youthful prodigy who mounts the beanstalk and invades the realm of the giant. In this the Thanhouser Kid appears as Jack and makes a very creditable appearance in all of the various scenes. The production is not particularly spectacular, but it adheres to the fairy story very closely and will delight childish observers as well as older people." "A two-reel fairy film for the little folks, prettily tinted, following faithfully the famous fairy story of that name. The story is true to fairy life and filled with a grotesqueness, and the impossible that is so dear to the childish imagination. It is unfair to judge this offering from any but that of the audience for which it is intended, and for such it will be a huge success. The pretty tinted autumn woods, the laughable antics of the make-believe dog, the wonderful beanstalk, the giant's huge baby, and, lastly, the ugly man-eating giant himself, all help to make this a film which will appeal mightily to the kids. The acting of the Thanhouser Kid, who takes the lead, is some of the best work that he has done. The Kidlet gets into the picture as the tiny fairy, and pleases mightily. In fact, this play for kids is acted principally by the kids, and it ill-behooves us to step into the realm with any of our worldly criticism, so that we prefer to withdraw and let the children approve of it for themselves."